But despite Chum’s observations and doubts, Corey cut a deal for the uniform and snagged it for $31,000. The pawn-shop purchase made headlines and the alleged Mays gem was promoted everywhere from the Huffington Post to USAToday. By the time two writers from TheOnlineSeller.com visited the Vegas pawn-shop in April of 2013, the Mays jersey already had a price tag of $80,000 attached to it. When a member of the “Game Used Universe” forum visited the pawn shop this past May it was still priced at $80,000. Earlier this week that same Mays jersey appeared for sale at Julien’s Auctions in Beverly Hills with the consignor advertised as “The World Famous Gold & Silver Pawn Shop” and the uniform went on the block receiving only eight bids and according to sports auction director, Dan Nelles, sold for $19,200. New evidence, however, shows that the uniform is not genuine and suggests that the Pawn Stars could have saved 31-grand and avoided selling the fake if they had just listened to Chumlee whose healthy skepticism on the History Channel episode mirrored the thoughts of uniform expert and historian, Dave Grob, who told Hauls of Shame on Tuesday that the uniform was bogus and never worn by Mays. According to Grob, the uniform is nothing but a Spalding salesman’s sample with minimal value. 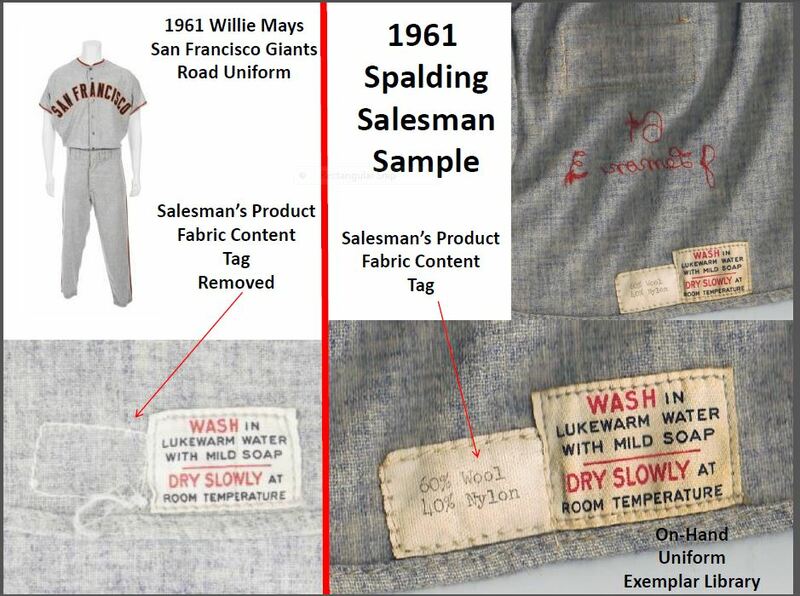 Grob, the senior uniform authenticator at MEARS, knows a thing or two about evaluating Mays garments as he just recently shot down an alleged $675,000 1951 Willie Mays rookie jersey as a fake and spurred on a lawsuit filed last month against the estate of deceased collector Barry Halper. Expert and historian Dave Grob gave us an illustration identifying the Pawn Stars' uniform as a salesman's sample never worn by Mays. The flannel jersey retained the remnants of a tag that was removed and was only used on samples. Grob provided an image of a sample in his exemplar collection for comparison (right). Heritage consignment director and Antiques Roadshow appraiser Mike Gutierrez (right) authenticated and appraised the bogus Mays jersey at $25-35,000 on a 2011 PBS episode. The Mays uniform was first examined and appraised by Heritage’s Mike Guiterrez at an Antiques Roadshow event on August 6, 2011, and was then presented by the same owner, identified only as “John,” on a Pawn Stars episode called “Free Willie” that aired in August of 2012. When the jersey and pants were presented for sale to the shop for $45,000, Corey Harrison told the seller “I’m gonna need some proof before I shell out that kind of money” and he called in local memorabilia dealer Jeremy Brown, of Ultimate Sports Cards and Memorabilia, to examine the uniform. Brown noticed the “immaculate condition” of the garment and suggested that the uniform lacked evidence of “game use” and concluded that it was “game issued.” He told the seller, “Although it can’t be proven that this is a game used jersey, this is a 100% authentic jersey that Willie Mays was issued.” Brown was correct in his determination that the uniform lacked game use, but that was because it was a salesman’s sample that had never been issued to Mays. Pawn Stars tweeted a picture of the "Old Man" flashing his signature glare with the caption: "That moment when someone tries to sneak something fake past you." The seller known only as "John" did just that on the "Free Willie" episode (left) where he sold his uniform fake for $31,000. Hauls of Shame called Jeremy Brown at his memorabilia store in Las Vegas to ask if he knew of any other experts who examined the uniform and what his background was in regard to uniform authentications. Brown did not return several calls to his shop. Laura Herlovich, the public relations representative for the Pawn Stars cast, passed along our inquiries about the Mays uniform to Rick and Corey Harrison and Chumlee. We asked the cast for the identity of the seller and the experts who examined the uniform as well as asking whether the store would contact the auction house and offer a refund to the winning bidder. The cast of the popular cable show failed to respond to our request and say whether they will seek a refund from the man who sold the garment on the History Chanel episode. It is also unclear whether any third-party questioned the authenticity of the uniform since its acquisition and also unclear why the Las Vegas store and Julien’s Auctions didn’t retain the services of a skilled expert like Dave Grob who evaluates uniforms for the authentication company MEARS. Grob has authenticated the most valuable uniforms in the hobby including the record breaking 1920 Babe Ruth jersey that was purchased by movie mogul Thomas Tull for $4.4 million. Pawn Stars expert Jeremy Brown (left) authenticated the bogus Mays jersey that sold at Julien's Auctions for $19,200. Expert Dave Grob is considered the authority on uniforms and authenticated the record breaking $4.4million Babe Ruth jersey. The initial authentication and appraisal conducted on the set of Antiques Roadshow gave the Mays uniform instant credibility that it never deserved. Appraiser Mike Gutierrez’ observations that the jersey was in such pristine condition should have warranted a closer examination of the garment but it only gave the seller additional cache to market the uniform for sale. We called the Antiques Roadshow office at WGBH in Boston and asked show publicist Hannah Auerbach if she was aware of other Roadshow episodes where a non-genuine artifacts were authenticated and appraised as the genuine article? Auerbach told us she was not aware of a similar situation and could only cite instances where some appraised items ended up selling for lower prices due to market fluctuations, but not because they were fraudulent like the Mays uniform. Auerbach also noted that appraiser Mike Gutierrez is not on the current roster of appraisers on tour for 2014. Dave Grob told us the Mays salesman sample was worth between $2,000-$3,000 as opposed to the $35,000 appraised value assigned by Gutierrez. For comparison, SCP Auctions is currently offering a genuine 1967 Mays road uniform graded “A-10″ by Grob and MEARS which already has a bid of $35,433 with one day left in the auction. 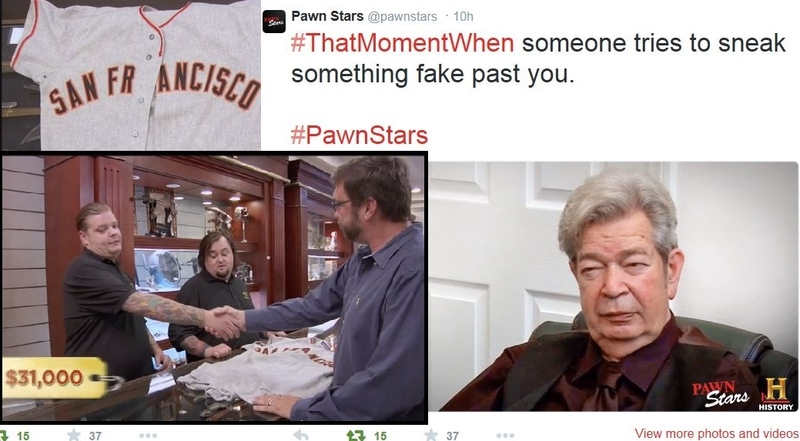 Ironically, 24 hours after they sold the fake Mays jersey in Beverly Hills, the Pawn Stars Twitter feed posted a message stating “What it looks like when someone tries to sneak something fake past you.” The Tweet was accompanied by a photo of store patriarch Richard “Old Man” Harrison flashing his signature glare of disapproval usually directed at his son, grandson and Chumlee. Safe to say the “Old Man” won’t be happy when he hears how Corey got ripped off and how the store subsequently sold a bonafide fake at auction (at a $10,000 loss). This time, however, the Pawn Stars won’t be able to blame Chumlee. Way to go old buddy! There is an episode of Pawn Stars where Rick bought a fake autograph of Shoeless Joe Jackson. The seller said he didn’t have time to wait for the autograph expert to come in, so Rick took a chance and bought. I never saw Chumlee laugh so hard after Rick was told that the signature was fake. I’m impressed that Pawn Stars had a genuine seller and buyer. Much of what happens on the show doesn’t pass the sniff test as being a genuine commercial interaction, as opposed to a staged bit of theater. They once had a nineteenth century scorebook from a (IIRC) random amateur club. They did the “call in an expert” routine. Nothing he said was exactly wrong, and his valuation was not unreasonable, but he obviously didn’t have any special knowledge of early baseball. Furthermore, some of the players listed went on to be professionals. A few minutes spent on baseball-reference.com could have turned up a lot more information and some reasonable guesses about the date and place of the club. For that matter, the “seller” could have done this. My guess is that the book was actually in the “expert’s” inventory, and that he had no interest beyond the value of a random nineteenth century scorebook. At least the jersey didn’t have a fraudulent signature on it. I just goes to show you that the experts on these reality are not the experts that you use. Just because you are in the business and you are on TV, it doesn’t make you an expert. There are a number of experts in the major auction houses in the US, and there are a number that are proven, you might want to use them. As for Chumlee, he is definitely is not an expert. I saw the episode and it was a lucky guess. I used to watch pawn stars all the time but it’s such scripted bs now I can hardly watch it. I agree. I’m more surprised this was a real transaction. Excellent analysis. I am constantly amazed as to how these people when told something may be fake refuse to go the extra mile to ensure authenticity. Moreover, the fact that nobody returned your e-mails and phone calls is another indictment to the amorality of these people. May I ask, who in your personal opinion would you consider to be the top expert on signatures of Lou Gehrig? Keep up the excellent detective work! I gather the Lee Trythall commenting here is Fake Lee and not the real Lee who sells fakes via the roaches. I am the fake Ted T.
Thanks. If I have questions about Gehrig signatures I usually ask author Ron Keurajian for his opinion. Yes, Chumlee is no Dave Grob. Antiques Roadshow has done fake apprasials before. Way to go Chumlee!!! He knows more than those other “experts” in the field and does not lie about his resume!!! Those were fake appraisals of genuine civil war items. 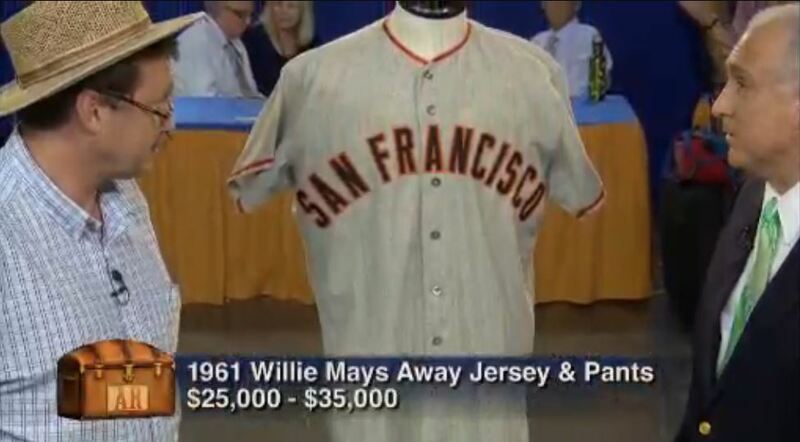 The genuine “game used” 1967 Mays Giants road uniform authenticated by Dave Grob and MEARS sold for $100,266 last night at SCP Auctions, about $80k more than the Pawn Stars salesman’s sample never issued to Mays. Although there is no standard vocabulary or codified terms of reference within the sports memorabilia industry for baseball uniforms, I have always used this as my definition of a “Salesman Sample”: Term used to describe a uniform or uniform related product that was manufactured and or distributed to create awareness or interest in a particular manufacturer’s uniform line. The Willie Mays uniform in question is not a fake, but a uniform that was misidentified as being something it was not. Over the years, and regrettably with ever growing frequency, I am seeing the term “salesman sample” being applied to uniforms that are fakes. Applying this moniker appears to be growing in popularity, partly because I suspect sellers are hoping that an unknowledgeable buyer may be thinking there are getting a game used jersey from someone less knowledgeable than they are. The Mays uniform was not a genuine team issued uniform made for Willie Mays. It was not a uniform made for Willie Mays yet has the Mays name chain stitched into the fabric. If it was sold for what it actually is it would be appropriate to call it a genuine salesman’s sample. It was, however, sold as a genuine Mays uniform issued to him and it is not and in that context it is, in no uncertain terms, a fake, non-genuine, not authentic, misrepresented and also possibly fraudulent if anyone who owned it had knowledge it was a salesman’s sample. I do agree with you that outright forgeries should not be referred to as salesman samples when they are not. And for that matter, forgeries should also not be represented to be “replica jerseys” after they are exposed as frauds.